A body-on-frame truck? Too much. A plump crossover? Too little. What you want is something in between. Something that’s got a unibody, front- (or available all-wheel) drive, and independent suspension, but also short overhangs and some good off-road modes for the muddy bits. Enter the 2019 Honda Passport. And while it’s on the same platform as both the Honda Pilot crossover and the Honda Ridgeline pickup, you can probably think of the new Passport as closer to the Ridgeline side of things. Honda claims that its “i-VTM4" all-wheel-drive system enables “robust off-road capability,” which we’ll see about, and it offers snow, sand, and even mud modes to help you get going in the boggy bits. Though, on the other hand, it also says in the press release that the new Honda Passport comes standard with 20-inch wheels, which would seem counter to efforts at off-roading and also pot holes. All of that traction management and wheels and suspension are used to put 280 horsepower from a 3.5-liter V6 to the ground, and the wheels are joined to the engine by a nine-speed transmission. Every Honda Passport will also come standard with the “Honda Sensing” system, which includes stuff like automatic emergency braking, rear-cross-traffic alerts, lane keeping, and adaptive cruise control. It can tow, too, with 3,500 pounds being towed by the front-wheel-drive version, or 5,000 pounds by the all-wheel-drive version. Also, it’s got a “segmented underfloor cargo compartment,” which Honda says is good for “carrying dirty gear” or “keeping valuables out of sight. I’m going to choose to believe those are both euphemisms for smuggling contraband past cops. Good on you, Honda. Though possibly the funniest thing for me, on a personal level, is that Honda says the tailgate design “emphasizes width.” Some might say that my own tailgate design emphasizes width. I’m getting old, too. But this new Honda Passport feels like it comes right from today. Correction: This post originally referred to it as the 2020 Honda Passport. 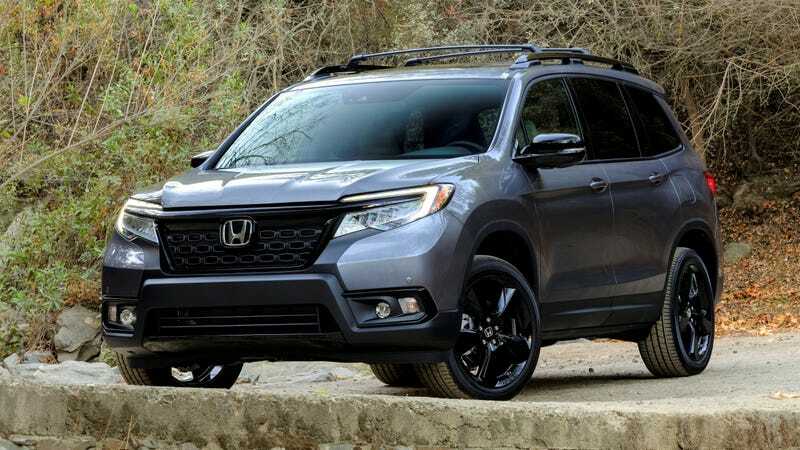 It is officially the 2019 Honda Passport, and has been updated to reflect the model year change.